Released in 1959 the Mark 2 Jag’ was a beautiful, fast saloon. It fitted particularly well with Sir William Lyons' maxim of "grace, pace and space". It came with a 6 cyl Jaguar XK engine, similar to the unit used in the 3.8 E-Type. It shared the same block, crank, connecting rods and pistons. However the inlet manifold and carburetion was different (two SUs as opposed to three on the E-Type) so power was down by around 30 bhp. Also the Mark 2’s head had curved ports compared straight E-Type port configuration. As soon as the Jaguar Mk II was released, it attracted the attention of the racing world. And with good reason; the Mk2 went on to totally dominate saloon car racing all over the world in the early sixties. It earned its first outright win in the hands of Sir Gawaine Baillie in 1960 at Snetterton. Over the winter of 1961, John Coombs mechanics built up “BUY 12”, or more accurately stripped it down, for racing. 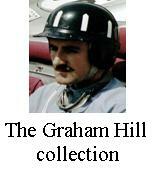 Its leading drivers for the coming season would be Graham Hill, who contested most of the season, and Roy Salvadori who filled in when Graham was committed elsewhere. That year the car swept all before it. Hill took third place in the opening race at Snetterton before going on to secured wins at Oulton Park, Goodwood, Silverstone, Mallory Park and the second Snetterton meeting. Salvadori took first place at Crystal Palace (Hill was away driving Coombs E-type to 3 podium finishes at Mallory Park). Hill crashed out at druids bend of the first Brands Hatch meeting. He also missed the Aintree race and the second Brands Hatch race being primarily engaged with F1. When Ian first opened the box of this kit he was stunned. It was by far the most advanced kit he had ever seen (then). The chromed parts were just the right side of shiny, the metal logos and details, the perfect decals and superb moulding..... Ian thought there was no way he could ever build this kit, he just couldn’t do justice to it! Eventually the lure to build it was just too great and he plunged in. It was a joy to build going together without a single hitch. The only thing he didn’t like was the metal details. They just didn’t want to bend enough to stay in position and the adhesive wanted to stick everything to the car causing a proper mess. Any way the model got built and at the time looked great, like most of displays travelling cars it has had its fair share of bumps and repairs. Painted with our standard Halfords car paints and citadel acrylics. The wheels stand out due to several washes of acrylic ink. Bare metal foil was used for the window surrounds. The seats were dry-brushed and washed with inks to give them some depth and reality. We have found it possible to match the replicated wood decals by using thin coats of Tamiya clear orange over a base coat of bronzed flesh. Grain is applied to the base coat by means of an old brush, i.e. random untidy bristles, lightly drawn over the surface to leave random sized and shaped lines. With experimentation differing wood effects can be obtained.